This article tries to understand the impact of brand communication on impulse buying for the chocolate category in the Indian market with a special focus on personality theories. Also discussed is the influence of factors like pricing and effectiveness of advertisements on buying decisions for goods such as chocolates that are mostly associated with impulse buying. Traditionally, the appeal of marketing communication is classified into either functional or emotional. As the Indian market matured in the last decade, advertising gurus have widely accepted that emotional appeal is what works with the Indian audience. However, the personality dimension of marketing communication has been left relatively unexplored even now. We went about applying the personality aspect of consumer behaviour on one of the categories of our choice. The natural choices for categories, if you start with Freudian theory, are the ones associated with sensuality like deodorants or products associated with hedonic pleasures like alcohol and cigarettes. The blanket ban on advertising in the second set of industries led us to think more about our choice of product category. That is how we stumbled on chocolate category that can be associated with impulsive behaviour and also with sensuality, at times. It is important to understand the strategies of dominant brands in the market before we go on to analyse the brand communication. Cadbury is the biggest player followed by Nestle, and they cover amongst themselves over 95% of the market share1. The perception map in Exhibit 1 shows the positioning of popular brands graphically. Cadbury is the market leader with around 60% of the value sales. It boasts of several strong brands in the category covering almost the entire spectrum of consumer needs. Dairy milk is the megabrand of the Cadbury Family focusing on consumers of all ages. The core proposition is 'something to celebrate all the good occasions in life with'. The communication proposes that no matter what the occasion of your happiness, Dairy Milk is the perfect way to celebrate. Silk is a premium variant of dairy milk and aims to give an upmarket stretch to the core brand. The positioning of Silk is 'Smoother, Creamier and Chunkier'. The communication focuses on the experience of eating chocolate with childlike innocence and unabashed joy. The tagline 'Have you felt Silk lately?' tries to give a refreshing feel to the entire experience of chocolate eating. 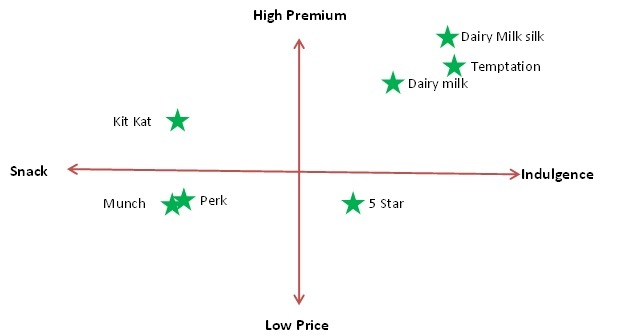 Perk�s target market segment in India is the causal snack space that has primarily been dominated by chips and wafers. The target consumers are teenagers and the advertising just highlights its role as a mini snack. 'Thodi-Si-Pet-Pooja' campaign, featuring mischievous teenagers, defined its brand personality. Celebrations� target market was to replace the traditional gift options like traditional sweets and dry-fruits during festivals. The communication focused on the emotions related to gifting. The target segment for this brand has been the youth and children. The brand has continuously focused on variants to add an element of surprise in the chocolate-eating experience. Nestle ranks second with 31% of the value sales. A large product portfolio and a strong distribution network have helped the company in maintaining its leadership along with Cadbury. The brand's commercial focuses on 'Have a break, have a Kitkat'. Nestle Kit Kat was well received by consumers in early years owing to both the novel 'finger format' of the chocolate as well as the way its advertising celebrated the 'consumption ritual'. Munch is the largest distributed brand in its category. It is a wafer chocolate. The campaigns of Munch focus on its crunchy taste. Priced at Rs. 5 it targets the middle class in metros and smaller towns. Sigmund Freud�s personality theory is the most popular of personality theories but most difficult to apply to brand communications. We have also used a Neo-Freudian theory by Horney and a modern, more widely accepted Personality-Trait theory for our analysis. Freud�s theory says that Human Psyche consists of two conflicting parts. The first, the 'Id', is the impulsive, child-like portion of the psyche that operates on the 'pleasure principle'. The Id wants what it wants and disregards the reality of the situation. The second, the 'Super-Ego', is the moral part and develops based on the social and ethnic constraints taught to us. The third part that develops later on is the 'Ego'. The rational Ego attempts to strike a balance between the impractical hedonism of the Id and the equally impractical, extreme moralism of the Super-Ego2. At the first level of analysis, it seems that this theory is applicable only to cases where there exists a clear-cut case for sensual pleasure. Some ads like Cadbury Silk�s staircase romance ad clearly show a dominant 'Id' in form of childhood romance. The Super-Ego forbids it, so the Ego finds a way in the form of having a Dairy Milk Silk together, as a potential method to express forbidden-by-society feelings. For some of the other ads we were not very sure if an 'Id' existed at first. However, if you start looking at 'Id' as the force responsible for all kinds of human urges (and not just sexual), even a tagline like that of Cadbury Dairy Milk�s, 'Khane-Walo-Ko-Khane-Ka-Bahana-Chahiye'(Rough translation: They just need an excuse to eat it), gives some interesting results. The ad is aimed at encouraging the consumers to ignore the 'Super Ego' that tells the consumer to eat chocolates only when there are specific occasions/reasons for the same. The 'Id' on the other hand, guns for instant gratification. The ad helps to strike a balance between the two, by telling that to consume a delectable product like the Dairy Milk, one does not need any excuse or if you have to look for one, you can find plenty. Another popular personality theory by Karen Horney tries to identify personality types as three categories � Compliant, Aggressive or Detached. The Compliant type has dominant needs associated with 'moving towards people'. They work to please others. Aggressive has dominant needs associated with 'moving against people'. They seek to be the best. Detached has dominant needs associated with 'moving away from people'. Such an individual seeks self-sufficiency and independence3. We applied this theory to understand whether particular ads appealed to consumers who were more inclined to either of the personality types. Some of the ads like the Dance Troupe ad for Cadbury Dairy Milk Silk clearly target detached consumers. In the ad a member of a dance group is shown busy eating a Silk just before her stage performance. She has spoiled her face and is already late for entry on stage but she is lost in her own world. Cadbury�s 'Khane-Walo-Ko-Khane-Ka-Bahana-Chahiye' tagline stands out once again as it is aimed at the compliant individuals who are hesitant to break away from the societal rules. The message conveyed in the ad helps them come to terms with the idea of eating chocolate anytime anywhere based on their urges without caring for what others think. If readers remember the Cadbury Perk commercial featuring Preity Zinta (or Trisha in South India), they can probably figure out that the personality types shown are of the aggressive kinds. The protagonists break rules and societal boundaries to get what they desire, the desire being the Chocolate bar here. Consider how you would describe the personality of a close friend. Chances are that you would list a number of traits, such as outgoing, kind or even-tempered. A trait is a relatively stable characteristic that causes individuals to behave in certain ways. The Trait theory suggests that individual personalities are composed of broad dispositions called traits. Cattel came up with 16 key personality traits that he uses to describe most aspects of human personality4. We tried to map the personality traits targeted or represented through various commercials. Simultaneously, we tried to match the overall personality of a brand as reflected by overall marketing communication and consumer perception on these personality traits. An interesting finding was the difference in traits observed for Nestle Munch�s recent commercial featuring the boxer Vijendra Singh from their overall brand image. For traits like 'openness to change' and 'privateness', not only was the ad in-consistent but also conveyed a brand personality significantly different from the overall brand personality built over the years. Munch�s projected brand personality has shifted in six of seven relevant traits from the last ad campaign to the current one. These inconsistent brand personality projections may lead to confusion in the minds of consumers who will rather shift to another related brand with a more consistent personality. 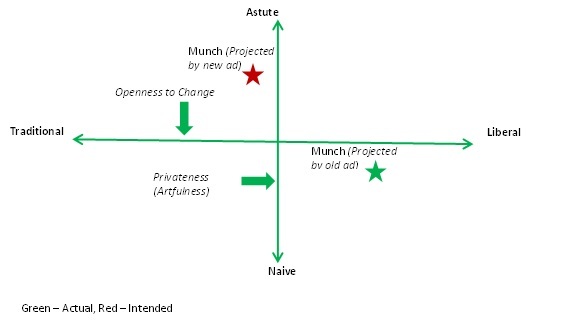 Exhibit 2 shows the differences in positioning of Nestle Munch from old to new ads with two of these traits as dimensions. Impulsive behavior occurs when the consumer is looking for immediate hedonic benefits. It is commonly associated with urges to smoke, drink, overspend or overeat. 'Impulsive behavior' is defined by 'Consumers experiencing an irresistible urge to consume', which they might even regret later. Whether an individual focuses on cost or the benefit of impulsiveness depends on the chronic values of the consumer, which forms the core of its personality. Hedonic personalities will focus selectively on the benefits than the cost of impulsiveness and are considerable uninfluenced by the costs. Hence, such individuals become insensitive to price aspect when their hedonic urge is driving the purchase decision. Let us explain the growth of the market at the higher end of the spectrum in recent years in chocolate category with this argument. The product offerings on the higher end are of rich chocolate (e.g. silk) based products (associated with taste and pleasure) instead of wafer-based offerings (which serve as a snack). This shows that brands command a better premium when an impulsive urge rather than functional benefits are the prime motivators for purchase. Even though chocolate buying behaviour is impulsive, research suggests that the relative accessibility of inputs such as costs versus the benefits of impulsiveness influences impulsive behaviour5. Impulsiveness is unaffected by cost highlighting arguments which explains the ineffectiveness of advertisements discouraging cigarettes, alcohol, etc. When the benefit of impulsiveness was the pleasure of yielding to temptation, the advertisements, that 'triggered the desire' or 'highlighted the benefits of giving in to the temptation' appealed most to the hedonic individuals. However, the prudent personalities give more value to the cost than the benefits. Thus, the benefits are relatively non-influential in judgment. Thus, advertisements that justify the cost of impulsiveness can help provoke impulsiveness in such consumers. Brand communication, if carefully designed and targeted, can influence the impulsive buying behavior of consumers. Personality traits of the consumer play an important role in how brand communication affects the impulse purchase process. This interaction also determines the amount of impact pricing of the product will have or not have on impulse buying. Takeaway for chocolate marketers is that benefit focused brand communication targeted at hedonics and cost-justifying communication targeted at prudent do work. Marketers can better utilize this approach to carefully develop and maintain a brand communication that targets the specific traits of the consumer�s personality and projects the intended brand personality to build a loyal customer base. Freud, Sigmund, "The Ego and the Id", The Hogarth Press Ltd. London, 1949. Karen Horney, https://pantherfile.uwm.edu/hynan/www/407/40706HORNE.htm. Last accessed on Oct 25, 2011. Trait Theory of Personality, Kendra Cherry, http://psychology.about.com/od/theoriesofpersonality/a/trait-theory.htm..Last accessed on Oct 25, 2011.